To quote a hit teen movie, The Perks of Being a Wallflower, “we accept the love we think we deserve. Wow, isn’t that the truth. Take a look around you and see who is with whom…just observe. In my thirties I remember trying to figure out why all of my amazing, competent, smart and beautiful girlfriends were dating guys who were not shall I say, quite their equals? I looked around and saw gorgeous, driven and focused women, dating guys with no brains or drive. It took me some time to realize that I was doing the same thing and from that moment of realization on, the healing began. Awareness lit a spark and I started to pay attention to the guys I was drawing into my life. My self confidence began to grow with meditation, yoga and age I suppose as well. It took time but finally I was ready to meet Satya and accept his love. I must admit that the first two years of our relationship blew me away because honestly, I didn’t even know that level of love even existed. I was blown away by his unconditional love. Yet I was ready, I was ready to accept the love I finally knew I deserved. What do you deserve? Look around at your friends and see if they are in relationships that are worthy of how amazing you think they are. I hope you feel worthy of unconditional love and that you have accepted into your life fully. India always gives me a fresh, new perspective. After 30 hours of travel, coming from the other side of the world, I arrived to Nashville last week from a short stint in India. This was a brief trip, just three weeks yet still the magic of India is alive in me. One of the things I love most about India is how crazy it is. Sometimes India is so incredibly uncomfortable that it actually accentuates the stillness I have within. This is the lesson that India has blessed me with over the years. How to find the stillness inside me, even in the midst of chaos. There is an awareness behind your eyes that great teachers like Ramana Maharishi and Eckhart Tolle describe. The stillness that is watching your life. There is a presence there listening and watching. Your personality changes, your body grows, your hair and nails get longer, but that still silent witness within you was always there even when you were a baby. Find this in the midst of your busy life. The way to do this is to create space in your mind and in your life. If you fill up every spare moment doing, seeing, talking, turning things on, then you may not have experienced what I am talking about. Yet even if your mind has constant input underneath this chaos watching, always there, still and silent, even as you read this, you can feel a presence there listening. Feel your aliveness, be consciously conscious of who is aware of the one who is reading. Most especially in the busy-ness that prevails all of our lives, let consciousness reside more deeply. Can you feel it? It is palpable if you invite it into the present moment. This is one way to create space in mind. If you look at life from a physics point of view, we are made up of more empty space then matter. So why don’t we experience space in our minds then? It is because we are not looking in the right direction. The direction is inward, not outward, not in the thoughts or even concepts, but the awareness of those thoughts. Another way to create space is to do your best not to get caught up in any one else’s story. Your story is enough for you to try to be consciously aware. Learn to be at ease with each moment. Accept everything and resist nothing. The pain comes in the resistance of what is. Pain comes when you try to poke your nose into someone else’s story. If you read this and can’t understand what I am saying then considering coming to Ivy House and joining in the Course in Miracles discussion group two Thursday nights a month. Meditation also will help you cultivate this awareness. Yoga is a tool and also jogging or doing anything you love. Every moment of every day is an opportunity to become free. To be consciously conscious. ! The Ivy House is here to support you on your spiritual journey. If you are sick and tired of being sick and tired, then it is time you come and see us. Be the change you wish to see. No human being is meant to wake up in the morning and dread the day. Human beings, each one of us, has the potential to be blissfully happy each and every day. Come and see us at Ivy house. We are here to help you find the bliss that resides within you. We are living in an epoch of human history where what we do now, the decisions we make, will be the deciding factor to whether we thrive or parish. You are a part of this. We are are all in this together people! Who are you? Somewhere inside each of us is a calling, a longing to be something, to have a purpose. The Ivy House is here to support you in finding your purpose and assist you on your spiritual journey. We are here to help you nurture the calling within you. If you have a nagging feeling that there might be something more to life then your to do list. If you are stuck and are sick of yourself or tired of being stuck or just plain ole sick and tired of being sick and tired, then it is time you come and see us. Be the change you wish to see. These all may sound like cliches to you but they are all truth, unless you are living in frenetic numbness, then it all sounds like cliche. No human being is meant to wake up in the morning and dread the day. Human beings, each one of us, has the potential to be the greatest person you can imagine. But what happens? We get caught up in our to do list. Yet another days goes by when we don’t get to our ‘should’ list. What you need to do is somehow change your ‘shoulds’ into musts. We never, ever get to our shoulds, never. In the next newsletter I will talk more about turning your ‘shoulds’ into musts. In the meantime, try not to should all over yourself. Do you have a passion for the possible? We have some very exciting things coming up at Ivy House this year. Next week for 3 days only at the Ivy House, we have two gifted Healers coming to Nashville to do private sessions and workshops. I encourage you to book a session and sign up for the workshop, they will rock your world. This kind of opportunity does not come around very often so please treat your spirit with this. You are who you hang out with! Or as they say in sports, you are only as strong as your weakest player. If you want to work out, get fit and healthy, you have to hang with people or at least one person or two who love working out. Otherwise you just talk each other out of working out. If you want to meditate, you have to hang out with people who love meditating. If you have all kinds of ‘shoulds,’ in your life, in order to turn them into action, they have to first become a must. Somehow you have to make a list of why your should, should become a must. Brushing your teeth is a must. Eating is a must. What is a must for you? The definition of insanity is to do the same thing over and over and expect different results. Have you been acting a little insane the past few years? Have you been wanting and needing to change a few things but a few years go by and nothing has changes? You don’t have to wait to 2014 to commit to change, each and every day offers you a new opportunity to make the changes you need to make to create the perfect life you desire. The Ivy House was originally conceived as a place to help support people in their spiritual practices. At the Ivy House, we love to meditate and do yoga. We love eating healthy and staying fit. We love feeling good and being happy, content and cultivating awareness. So we are your support in joy and inner peace. Even in the midst of turmoil? It’s kind of like Hurricane Sandy or Hurricane Katryna. Even the most devastating hurricane has stillness at the deepest depths of the ocean. The eye of a cyclone is quiet. You have this awareness within you that is still even amongst your busiest day and craziest thoughts. And believe me, I know personally how crazy it can be over the holidaze! Take a breath and do your best not to play your usual role. We have these roles we play in our family that we keep playing over and over again. Eckhart Tolle calls it the pain body. Your pain body is like a little creature that comes out whenever you are feeling fear and pain. It is the hurt child within you, the damaged part of you that is not the real you. The holidays are one big gathering of the pain body creatures. The latest statistics are that you have 85,000 thoughts each and every day. 95% of those are the same thoughts you had yesterday. However the good news is that you are not your thoughts. If you visualize a triangle, a school bus, a kite in the sky, a stop sign, they come and they go in your mind as you read this. Your thoughts are just like each one of these visuals. You are not the bus or the kite, you are the awareness that is aware of those objects. Be in the awareness, the ever present witness that was the same when you were a child. I actually remember before I was born. Yup, I promise you I do. I have always been able to draw the incubator that they placed me in, on April 29th, 1963. But before the incubator I remembered how excited I was about where I was going and I even got a sense of where I was going. I knew that I would help people spiritually and that I would always have this memory. I remember how close to God I was and I remember saying goodbye. I awoke looking up to masks all around me and I was then placed in an incubator. I started drawing the incubator for my Mom when I was about five and I recently looked up an incubator image for 1963 and there it was, the one I remember. The next memory I have was when I was about 2 years old. Very clearly, I was sitting at the kitchen table in my high chair eating raspberry toast with my Dad as he was getting ready for work at 5am. I was thinking, I wonder if my Dad remembers when he was my age. I wonder if HE remembers before he was born. Then I decided then and there at 2 years of age, that I would remember this moment for the rest of my life. I have no idea how my 2 year old brain knew what to do next but I froze for at least one minute. As I was still I was thinking I am going to remember this moment when I am as old as my Dad (who at that time was only about 30 years old), seemed like 80 to me then. And now coming up to 50, I remember this like it was yesterday. This is the stillness within that I am talking about. If a two year old can do it, so can you!! It is the awareness that is witnessing your life. That is the real you. Not the thoughts, not even the memories, the real you, the real me is the stillness within that is always watching. 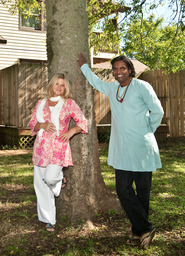 Happy Holidays to you from the Ivy House, from India and from my heart to yours, NAMASTE. I honor the place in you, that is the same as the place in me, and when we are both in that place, we are one. Namaste. I decided many years ago to wake up everyday and expect a miracle to happen. When we worry about things we draw them to us. When people spin out of control in a car, there will be a wall and they will surely hit the wall because that is where their eyes go. Where your attention goes, energy flow. What you focus on, you create. Worrying is praying for something you don’t want. Expect a miracle. Focus on wonder and awe. Every breathe you take is a miracle as there are millions of tiny miracles that had to happen to bring you to this moment. Research shows that sleep heals the body. Haven’t you ever had a sore throat and gone to bed for 10 hours and feel as good as new upon waking? Most people are sleep deprived. Get your rest!! Find something you love to do. Whether it is hot yoga, hiking, biking or taking a brisk walk, all it takes is 30 minutes a day to get the physical activity that your body needs. Our bodies do so much for us. They are our best friend. What other friend would still be with you after all the abuse you have put it through? Our bodies were made for movement and not to be sedentary. Move your body! Even excess protein turns to acid in your body as do carbs. Veggies are your best choice. We happen to live in a country where we can get pretty much any vegetable from anywhere in the world at any given time of the year. That is incredible. Take advantage of it!! If you do the above, you will maintain your ideal weight. Watch that five extra pounds that creeps on each year, do the math! This seems to be hard for most people. Why do we hold on to so much emotional pain? If you want to know why your body is the way it is, look at your mind ten years ago and if you want to know what your body will look like in ten years, look at your mind today. That pretty much says it all. The past is past, leave it there. In the six years that my sweet husband and I have been together we have had very few squabbles, silly things that last just a few minutes. We have not been angry at one another for longer then five minutes, ever. I wish that for everyone, I really do. If I ever bring up something from the past with Satya or if he even hears me on the phone talking with a girlfriend about a problem earlier that day, he says, that is in the past, why do you want to keep talking about it? Meditation has helped me with letting go. When I meditate, I don’t sweat the small stuff. Do you want to know how you can get yourself to be more disciplined to meditate? Somehow you need to value meditation more then you do now. Most of us are type A doers and to sit quietly for 30 minutes seems insane to the average busy person. Here now is a list of documented benefits of meditation as presented by the TM Organization who have been studying meditation for over 50 years. 1. Since meditators get sick 50% less then non meditators, and meditation enhances cardio vascular health, you are taking responsibility for your well being when you meditate. 2. I believe that changing the world does start with changing ourselves. Until there is no anger, fear, jealousy, addiction, spite or tension within us, then we cannot expect our politicians and leaders to be free of those demons either. Meditators show a decrease in anxiety, depression and stress, developing a happy, peaceful individual. 3. Meditation raises performance in the workplace by expanding creativity. 4. Meditators are smarter, studies show better communication between the prefrontal cortex and different areas of the brain developing total brain function. There is a great book called Radical Forgiveness by Colin Tipping that is amazing. Just when you think you have done all of your forgiving, another layer of the onion peels away. Treat yourself kind during this holiday season. A few years ago I decided to be present with my family instead of falling into my usual roles. It made a huge difference in my interactions and I still practice this every holiday. We fall into our habitual roles with our family and sometimes we become people who we haven’t been in years…but family brings out the best in us right? …not so much. What is the first rule when the plane is going down? Put your oxygen mask on first, right? I hope there are no planes going down in your life but I do know that life is very intense and crazy busy for most people. This is 2012 people, and it is not going to slow down any time soon! Instead of focusing on your endless to do list, how about asking yourself, why am I here? What do I really want? Then once you figure out what you want, you can create the steps to get what you want. My guess is the steps to get what you want will have very little to do with your day to day to do list. I could be wrong but that is my guess…. Be kind to yourself this holiday season. Take a break from your family when you need it. Even ten minutes here and there can make all the difference in your sanity. Then why do people keep searching everywhere else but inside? Being a Yoga Teacher and Life Coach allows me to glimpse into my students/clients lives. I get to hear about the misery inside, the pain that I hear about is all too familiar to me. I have been content for several years now and so it is an abrupt reminder when I hear of the struggle within, that really is the human condition. Deepak Chopra says that “all sickness, is home sickness.” The biggest killer in America is heart disease and Deepak says it is because human beings are homesick, they are heartsick and feel separate from God, or from one another. When I first started dating Satya I remember he use to joke about the space that Americans want and need. I realized after spending a lot of time in India, that we are incredibly spoiled and live lives of luxury that people in countries such as India can only dream of. On Oprah’s OWN channel she travels to India and visits Indian families of different classes. She visits the slums and goes into a tiny home about 6 feet square where a family of 4 resides. This is normal in India. Even a wealthy family that has 2000 sq feet of space will live there with three and sometimes four generations of a family of 15 to 20 members! We have created so much space between each other in North America that everyone is on prozac because they feel lonely and depressed. Human beings need connection and love, it is a basic human need. Some people need more of it then others but it crosses all languages and boarders and is a basic human need. Most people no matter where they come from or how confident and successful they may seem, have some sense of unhappiness, unease or unworthiness. Actually, all human beings down deep either feel unworthy or unloved just because of the fact that we are human and rely on other humans for survival for the first fifteen years of their lives! So what do we do about it? Instead of trying to busy ourselves to cover it up, why not look at it, admit it and then dance with it. This may sound like a cliche if you don’t practice it but I truly believe that ‘what you resists persists and what you look at, disappears.’ All we have to do is shine the light of our awareness on this feeling of unworthiness and accept it. Dance with it and don’t try to run from it. Just accept that this feeling will always be there, somewhere deep inside, but if you just acknowledge it, then it won’t try to take over your life. It is when we try to squash those feelings or even fix them, that they grow. Is this making sense? The only place where peace lies is deep within. But how do you find it? Well, that is what we specialize in at the Ivy House. I know how to find it only because I was tormented for many years with discontent, unease and restlessness…sound familiar? Or perhaps it is just a quiet gnawing within that something is not quite right. Or maybe you feel fine but you keep jumping from one relationship to another, or one job to another, or you keep renovating your home. Whatever unrest that you experience, it is the universe talking to you because we don’t make changes when we are happy, we just don’t. We don’t look for creative answers or sign up for a retreat or workshop or college course unless something is incomplete within us. No matter what your back ground or belief system we can help find what works best for you to find your inner peace. And that looks different for everyone. It just so happens that meditation and yoga worked for me but it may not for you. But I will tell you one thing. You do have to get quiet. Somehow, someway, you must get still and listen to the quiet sounds of the universe. Because God’s language is like the fragrance of a rose, or the sound of the wind in the trees, you must listen in order to hear. You must quiet your crazy mind, to hear the sounds of silence. I moved to Nashville in 1988 with dreams of being a Country Music Star, now 25 years later, I am living the most magical life! Sometimes not achieving our dreams, helps us uncover our destiny. This is what happened to me. Let’s face it, our lives never turn out the way we think they will, not at all! How could we possibly know the twists and turns that happen as we navigate this crazy adventure. I mean, I don’t even know year to year where I will be, let alone plan out the next 20 years! Is that just me, or your life too? Yet I have found over the years that the more I surrender into what is in my life, the more gratitude I have for what I have, the more I focus on the good, the better my life gets. It is kind of like going on a diet. If you focus on all of the things that you can’t eat, wow, the pain! But if you just focus on all of the thousands of things that you CAN eat, you are fine. Isn’t that just as in life? But you can’t teach people how to think positive. I know that I am blessed with a positive mind, that is for sure. I was born with rose colored glasses and an enthusiasm for life, yet I also have cultivated that and nurtured it and built upon it. I remember writing my father a letter a few years ago. My Dad is the opposite of me. He has always believed that if there was a GOD that he must be playing a joke on him. I mean, my Dad has had an amazing and wonderful life and yet he focuses on all of the negative and so now that is what he remembers. So I wrote him a letter to show him the different ways he could look at his life and also my life too. I showed him how if I looked at my own life in a glass half full manner that I could get totally depressed…and it was depressing writing about it. What you think about, you bring about. I don’t recommend that experiment at all. Yet it was a learning lesson. My life can look amazing if I am an optimist and incredibly depressing if I focus on the negative or just look at it through the eyes of the material world. All of us have this option. You can look at the past week, day even the last hour in your life the same way. You either look back at your life with a positive outlook with lessons learned (btw, someone once said that a learning experience is what happens when you don’t get what you want) or you look at it like GOD is playing a joke. I prefer the later.